Our 80s Pink Shell Suit Fancy Dress Costume see's us welcoming back one of the biggest trends of the 1980s with open arms. 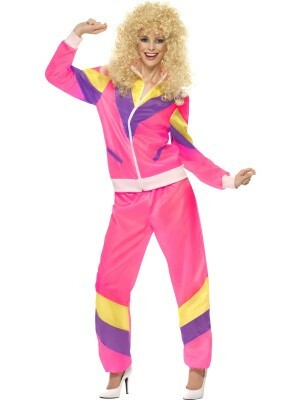 This Ladies shell suit is based on the popular fashion statement which arrived during the late 1980s and grew in popularity due to hip hop groups such an Run DMC. The iconic costume comprises of a tri-coloured zip up jacket with elasticated white cuffs and a pair of matching trousers. Excellent for any eighties or hip hop themed fancy dress event.